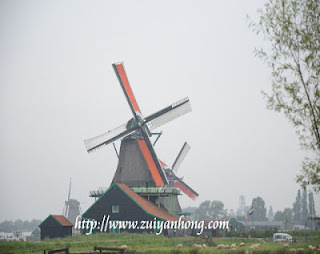 Zaanse Schans is a renowned tourist destination in Netherlands. It's located at about 14 km northwest of Amsterdam. Leaving Amsterdam Schiphol Airport, the coach driven by Hungarian driver Peter headed to Zaanse Schans. The weather is fine when we arrived at Zaanse Schans. I got off the coach to take a deep breath of free and fresh air in Europe. Besides the quaint windmills, the Zaan River view is truly killing. Zaanse Schans is relocated along the bank of Zaan River. The buildings in the village are replica of Zaanse village of the seventeenth and eighteenth century in Netherlands. Walking around in Zaanse Schans, really like going back to ancient Netherlands. Zaanse Schans is open for public to visit. There are shops, museums, restaurants, workshops and resident wooden houses. By visiting Zaanse Schans, you can experience the Dutch life in 17th and 18th century. Zaanse Schans opens seven days a week. The visiting hour is from 9 am to 17 pm. Admission to the Zaanse Schans is free but you have to pay for entering the museums. Ample car park is provided. The parking fees are used to maintain all the buildings in Zaanse Schans. Love the place. Looks cool and calm..
Zaanse Schans is a peaceful Dutch village. It's one of the must visit attractions in Netherlands.